Although he was the class clown, high school senior Lucas had charm, looks, athletic prowess, and a scholarship that meant a bright future. That is, until the night he and his beloved twin, Silver, drive into the middle of a gang ritual on a California beach road. When Lucas awakens from a coma, he learns that Silver is dead, he can no longer play football and the vintage Camaro he prized is trashed. With all his hopes and dreams shattered, Lucas turns to revenge…or justice. Suffering through his grief and anger, Lucas forms a vigilante club with his small circle of close friends. In his path to discover who killed his sister, he and his gang crazily target one of the town’s most fearsome gangs. He becomes somewhat cynical to hide his grief and the emotions threatening to unseat him, and it affects his judgment as he winds through his new life. A life he thought devoid of his twin sister. Then, Silver appears, crossing the line between life and death to try to save him. Lucas meets the new girl next door, Tara, and suddenly life doesn’t seem so hopeless. Tara can see Silver too, and shares her fears. But their love isn’t enough to stop Lucas’s posse of “vigilantes” from an act of stunning violence that marks him for murder. Can Lucas face the truth about what he’s become, or is it too late? Can Tara save Lucas from the darkness? “Lucas and Silver were inseparable. Their bond as twins connected them throughout their lives and, when tragedy strikes, the bond seems to endure past the grave. Lucas should have enough on his plate to deal with - needed to heal, recover and grieve the death of his sister, but something...or someone...is holding him back. Lucas swears he can see and hear Silver everywhere. She is always there, and she seems to be trying to tell him something. And so, he resolves to do just one thing, even if it's the last thing he does. He'll avenge Silver's death at all costs. 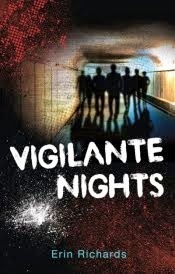 SPECIAL PRICE: VIGILANTE NIGHTS is an Amazon Big Deal eBook through 10/27/13. It’s your chance to get the Kindle version at $1.99 (that’s 80% off the original price)! Click to buy.